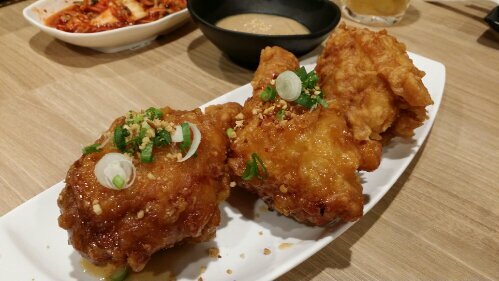 Guksu Restaurant wows guests with their signature Drumsticks and Jeongol - find out which was my fave dish! “Guksu” refers to Korean noodles or noodles dishes, collectively. This was indeed the core of Guksu Restaurant when it first started. Known for its homemade noodles, Guksu Restaurant did their noodles from scratch and earned fans with their fresh handmade noodles and broth. These noodles are best savoured immediately when cooked, but Guksu Restaurant has since shifted its focus on creating other delectable Korean dishes such as Jeongol, perfecting their signature kimchi and constantly keeping abreast on interesting add-ons to their menu. Read on to find out what we feasted on! 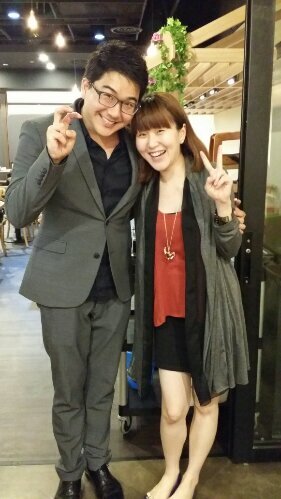 Our host, Mr Park, General Manager of Guksu Restaurant, was such a joy to be with. This smiley gentlemen made effort to introduce each dish, shared their story on how they were perfected and why some regular customers would keep coming back for their favourite dishes, and would be disappointed when a certain dish was off the menu while they did their R&D to cater to the locals. The first thing that struck me? THAT CRISPY SKIN…. I could literally hear the crunch! Their Guksu Signature Drumsticks are available in 3 flavours: classic, soya and spicy. Their homemade Signature Kimchi is a hit with chilli lovers! It was predictably too hot for me, although I only had a teeny weeny bit. That’s about how much chilli I can take. LOL. And the accompanying condiment was a homemade sesame sauce, with a paste-like consistency. If you’ve eaten Peanut Paste in a Chinese restaurant, it pretty much tasted like that, but with a slight sourish aftertaste. Interesting to say the least, but it was pretty much an acquired taste for us. And here comes the special guests for the night – Jeongol, an elaborate stew which was historically served to members of the Korean royal court as well as the nobility. As most of us would know, they are commonly referred to as “Army Stew”. We were served with 3 different Jeongol to share amongst the guests so the spotlights were on beef, pork and seafood versions. Each Jeongol is ideal for 2-4 pax, which makes a good dish to share when dining in groups and for pairing with white rice. 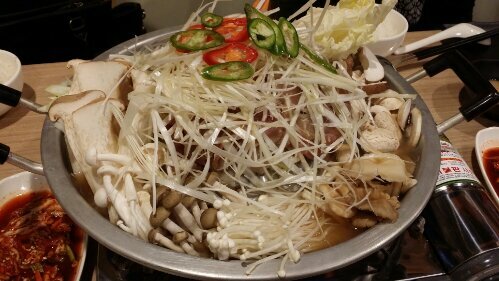 Here’s what was bubbling at the table next to me – Haemul Jjim Dak ($45.90), this one is for seafood lovers! 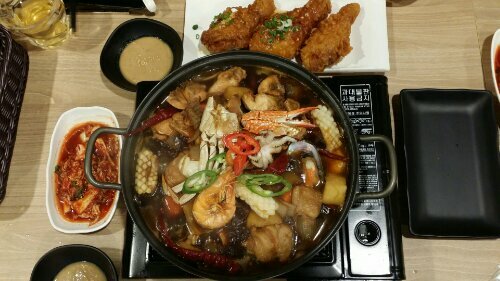 It is filled with vegetable broth, chicken, root vegetables, red chilli, glass noodle, flower crab, baby octopus, mussel all swimming in Korean special sauce. Fortunately, Mr Park did forewarn that this was a spicy dish, so I proceeded with caution. The sauce was sweet at the beginning but spicy thereafter, but some of the guests who weren’t much of chilli fans said that it was actually pretty okay for them. Guess it really depends on individual threshold! With the generous servings of ingredients in a thicker broth/sauce, I’d say this was very much stew-like and goes awesome with plain rice. If you love spicy food and prefer savoury options, this one is a must-try! Mr Park pouring soup over the Daeji Gogi Jeongol ($42.90), the pork dish. So the beefy dish was sitting right in front of us – Bulgogi Jeongol ($48.90), served with sliced Wagyu beef. It’s exactly the same as the Daeji Gogi Jeongol except for the meats. 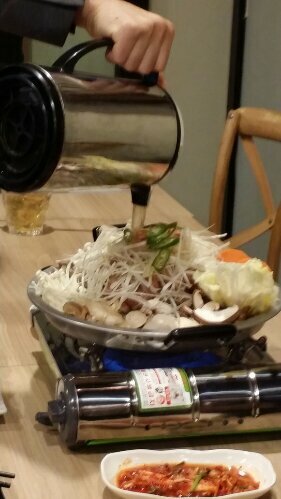 Sizzling meat cooking, and check out those mushrooms! And just as I thought we were nearly done, Mr Park brought 4 coloured drinks for us. With such pretty colours, it was hard not to give them attention. We winded down with a few shots of Cocktail with Guksu, infused with Soju and Lemon. Can you guess what flavours they are? Cheeky Mr Park preparing our drinks. They were: Passionfruit with Lemon, Peach, Raspberry and Blueberry! Did you guess right? Alcohol level was pretty low at 6%, and it was easy to drink and not surprisingly, a hit with ladies! The best seller? Raspberry takes the pie! 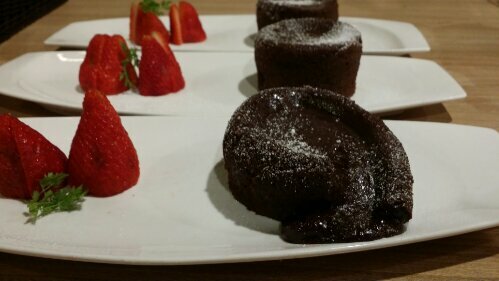 To complement our drinks, these Molted Lava Cakes were served up, ending our meal on a sweet note and on a high. LOL. This looked soooo appealing, I couldn’t resist taking a few mouths of it! The cake was soft and moist, with rich chocolate that oozed sexily as if to seduce diners. Because of my sensitive throat, I usually steer clear of “heaty” foods as such, so it was really mind over body when it comes to control. Ahem. Mr Park was a natural entertainer with his cheerful disposition and animation. We enjoyed a belly good time and it was lovely to chat with him. He shared that they were looking into home delivery services – imagine hunger pangs or cravings for Jeongol at 3am?! Who are you gonna call? We also found out that he used to be a chef, and has since moved to taking care of business operations for the company. This taekwondo, judo, sporty guy unbashfully said that he was single and cheekily asked if anyone wanted to have a teddy bear. LOL! Sporting Mr Park and I striking a pose! 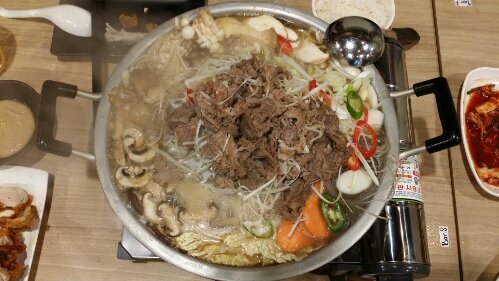 So the next time you’re craving for some Korean grub, Guksu Restaurant should be on your list of options. Centrally located and easily accessible by MRT and buses, this makes a convenient meeting point for weekday meals to catchup with friends too! For folks working in the vicinity, weekday lunches under $10 are available without burning a hole in your pocket! 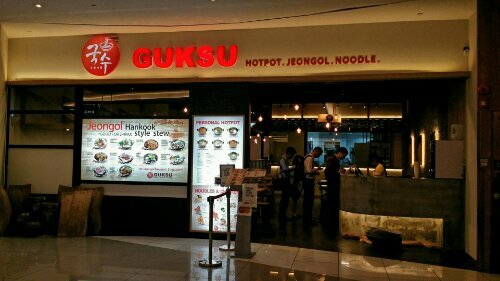 Guksu Restaurant comes under H group Holdings which has been operating the popular Kimchi Korean Restaurant (www.kimchi.com.sg). Thank you, Guksu Restaurant for having us! It was indeed a yummylicious experience! 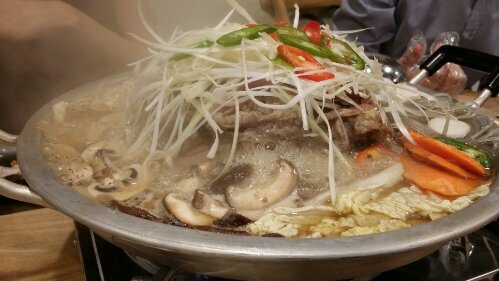 Have you dined at Guksu Restaurant? Which are you favourite Korean dishes? Tell us! Follow us on Instagram and Facebook to see what else we are up to!